5 classic dishes to enjoy in Mexico… or at home! Here are five classic dishes you absolutely must try when in Mexico. Be sure to sample them on your next trip down south because you won’t necessarily find them on the menu of Mexican restaurants in Quebec. Some of these dishes are easy to prepare at home too. Ready for a Mexicano culinary journey? Vámonos! The Yucatan Peninsula in southeastern Mexico is well known for the beaches of Cancún, Playa del Carmen, and other sunshine destinations. Sopa de lima is one more reason to set your sights on the Yucatan! A hot soup in a hot country? That’s right! Sopa de lima consists of chicken broth flavoured with lima agria, a bitter lime that gives the soup a refreshingly tart taste. The flavoured broth contains chicken, onion, tomato, and coriander. It is generally served with lightly fried tortilla strips and slices of lime. Delicious no matter how hot the weather! At home: When preparing sopa de lima, use the same broth as you would for your favourite chicken noodle soup. Add a dash of fresh lime juice and a spoonful of tomato paste for colour. Garnish with a sprig of fresh coriander, a slice of lime, and a few corn tortilla strips pan-fried for 5 minutes in advance. 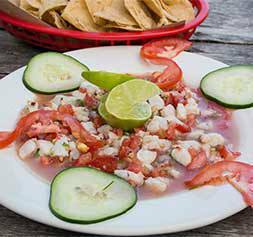 Aguachile is a type of Mexican ceviche that originated in Sinaloa, in the northwest part of the country. Today, you can find it in most coastal regions of Mexico. The dish consists of shrimp (or other fish or seafood) cured in lime juice and mixed with a salsa verde made with serrano and jalapeño peppers, coriander, and lime. It is served with cucumber and red onion. Spicy yet refreshing, aguachile is often accompanied with a side of tostadas. Made with corn tortillas stuffed with a variety of ingredients and rolled up, tacos are the quintessential Mexican finger food. Taco varieties are endless so let your creative juices flow! 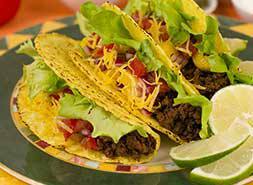 At home: When putting together a meal of tacos, start by choosing your protein source (grilled beef, roast pork, sauteed chicken, fish, shrimp, etc.). Then heat up the corn tortillas for a few minutes and let your guests fix their own with the filling of their choosing (cut into strips or small pieces). Add condiments such as salsa, cilantro, avocado, lime, and hot sauce. Fans of pulled pork will love this Mexican version known as cochinita pibil! Like sopa de lima, it’s a specialty of the Yucatan region. The pork is marinated for several hours in achiote, also known as annatto, a red-coloured spice. It is then slow-cooked at low temperatures, traditionally in large banana leaves. At home: Can’t wait for your next trip to Mexico to enjoy this pulled pork dish? Then buy yourself a large pork shoulder, drop by a Latin American grocery store for some achiote paste, and break out the slow cooker. Prepare the marinade by stirring a bit of white vinegar or orange juice into the achiote paste and adding two cloves of finely chopped garlic and a pinch of salt. Marinate the pork overnight in the achiote mix. The next morning, place the pork and marinade in the slow cooker and cook on low for 8 hours. By the end of the day the pork will be so tender you’ll be able to flake it with a fork. Serve your cochinita pibil with rice or veggies, or in tacos. Mole poblano: Anyone for chocolate sauce? 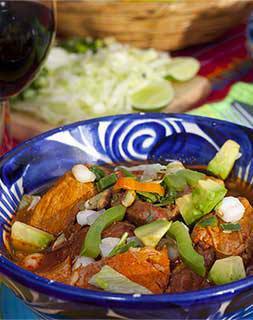 Mole poblanooriginated in the State of Puebla, in central Mexico. It’s a turkey dish prepared with various kinds of peppers, dried fruit, spices, and cacao. That’s right—cacao! Who says chocolate is only for dessert? 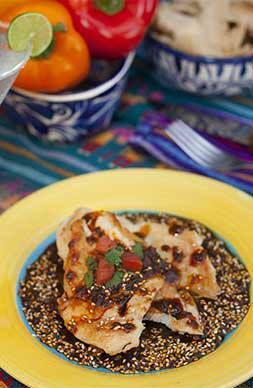 One mouthful of delicious mole poblano and you’ll be convinced otherwise! Enjoy peace of mind when you travel with Blue Cross travel insurance—the travel solution that meets your needs and keeps you covered in the event of an unexpected emergency. That way you can take full advantage of your vacation and all the delicacies awaiting you in Mexico or elsewhere around the world.